What are the Five Key Benefits of Pilates? Pilates is designed to help improve your core stability, focusing on addressing a weakness in your pelvic floor. Your core strength is so important in our everyday activities like running, walking, standing for long periods, lifting any weight, sitting and physical activity like playing sports. If you are suffering from pain anywhere in your pelvic girdle, hips or spine, Pilates can help. Targeting and focusing on your core, abdominal muscles and pelvic floor. The strength in the pelvic floor can be effected by many things, the common one in ladies is Pregnancy. Pilates was designed to help your body deal with the stresses of Pregnancy by helping build strength in the abdominal and pelvic floor, both pre and post natal. Help strengthen muscles, reducing back and neck pain. Areas can be affected often come from your inactive and weak muscles. This can lead to chronic pain and tension in your lower back and neck. We can identify through careful assessment these muscles that could be causing your imbalance throughout the neck, shoulders and back. Your tight muscles can decrease your mobility and lead to tension, poor posture, aches & pains. Great posture is so important for your fitness and for your spine. To help function effectively without excess strain on your frame. Pilates can give help give your body the strength to align your posture better and increase your overall flexibility. 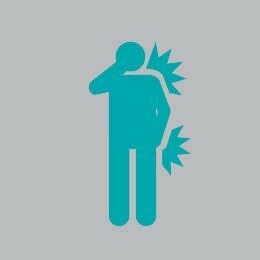 If you lack muscular support, have poor posture or muscular imbalances you could be more prone to injury. Pilates exercises can help build muscular strength and give support your joints to improve overall function and stability. Pilates can be a safe and effective way to rehabilitate from an injury. Pilates can be a great way to improve muscle control to assist in coordination and balance. It can help build up your cardiovascular exercise and increase endurance in fitness training and sports. Looking for Group Pilates Click HERE! Looking for 1-2-1 Pilates with an Osteopath Click HERE! Pilates is a form of physical exercise that focuses on your core stability, balance, control, flexibility and strength. 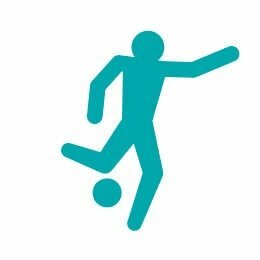 The exercises are often used in conjunction with Osteopathy and Sports Massage to aid treatment of a variety of injuries. 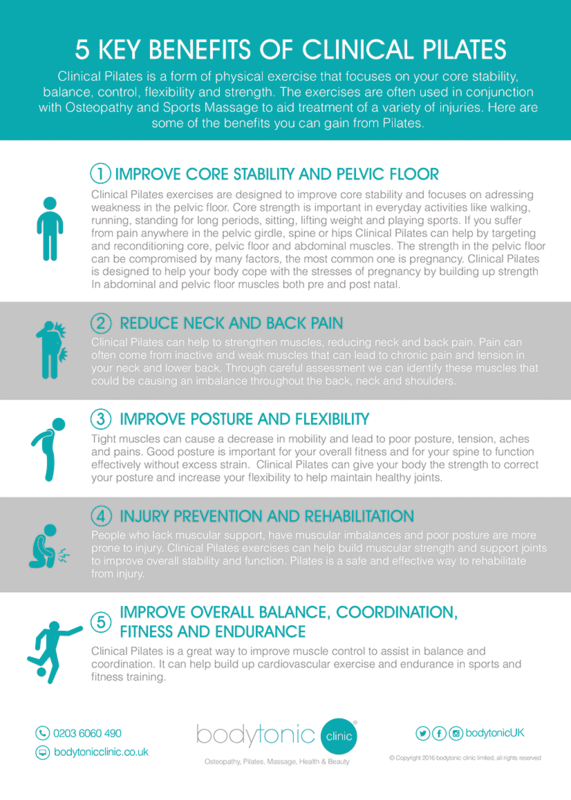 Here are some of the benefits you can gain from Pilates. Looking for Group Clinical Pilates, 1-2-1 Clinical Pilates or Yoga? At bodytonic clinic we offer Clinical Pilates classes, 1-2-1 Clinic Pilates and Yoga. You can read more about the different Clinical Pilates options by clicking on the links below. Book a Yoga class in Canada Water, Surrey Quays, Bermondsey and Rotherhithe today SE16? Book a Group Pilates Classes in Canada Water Se16 today! Book a personalised 1-2-1 Clinical Pilates class today! Pick up the perfect present today from our Canada Water clinic.